Take a horseback trail ride across a family cattle ranch with views of the West Maui Mountains, Haleakala and Maui's largest waterfalls! Saddle up for an exciting Maui equestrian adventure! Your horseback riding journey begins at the Mendes Ranch Corral, located in beautiful Wailuku. Upon arrival, meet the Paniolos, Hawaiian cowboys, before being paired with a steed chosen to match your riding experience! Gaze in wonder at deep blue seascapes, rolling pastures into the lush rain forest and peer into the Eki Crater. Paniolos will be glad to snap a photo of you on horseback during your ride - so don't forget your camera! This 1.5-hour horseback ride takes visitors down the edge of Waihee Valley to the coastline to view the magnificent Pacific Ocean before heading back up to the corral. From West Maui (60 min): Take Highway 30 towards Wailuku. In Wailuku turn right onto Main Street and take a left two blocks down on North Market Street. Follow N Market St for 6 miles and the Ranch will be on your right. From South Maui (45 min): Take Highway 30 towards Wailuku. In Wailuku turn right onto Main Street and take a left two blocks down on North Market Street. Follow N Market St for 6 miles and the Ranch will be on your right. Enjoy the best of Maui on this all-encompassing 2-hour horseback tour of the beautiful Waihee Valley. Get fantastic views of the West Maui Mountains, the crystal blue waters of the Pacific Ocean, central Maui, and the Haleakala Mountain summit! Note: A minimum of 2 guests is required to book a Private Tour. Participants should weigh no more than 250 lbs to ensure safety of participants and of the horses. Wheelchair Accessibility: Ranch transfer vehicle is not equipped with a lift, person must be able to board the van with assistance. 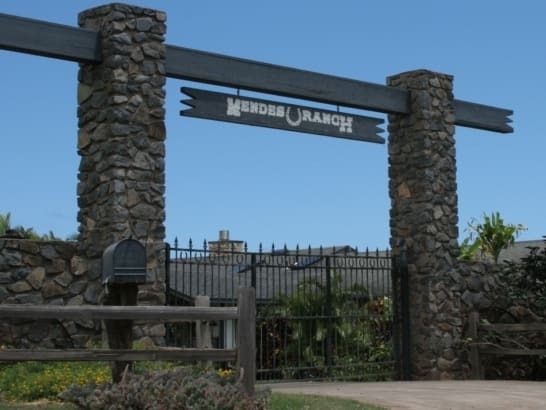 Mendes Ranch is wheelchair accessible. However, participants must be able to hold themselves up on horseback without assistance. Please indicate during booking for most convenient arrangements. Perfect for beginners, no prior experience is required! Guides are very experienced with taking 7 year olds on their first rides. Regardless of your riding experience, guides will match your ability to an appropriate horse. Will we be allowed to run the horses? If weather permits, there are designated areas around the ranch where advanced riders can trot and canter. Is this a drive by tour or will there be stops for picture taking? Several stops will be made for photo opportunities from your horse. There is a maximum of 18 riders at one time but you will be separated into smaller groups of approximately 6 - 12 riders. We recommend booking at least 2-3 weeks in advance. If you have very specific schedule requirements and are not flexible, please book sooner. Last minute availability is often possible, but limited. Our daughters really enjoyed this experience even in the rain for part of the time. The staff was excellent so helpful and friendly. The horses were easy to handle. The views were stunning! !